(Preface) The Carolinas Campaign began on February 1, 1865, when Union Gen. William T. Sherman led his army north from Savannah, Georgia, after the March to the Sea. Sherman’s objective was to join Gen. Ulysses S. Grant in Virginia to crush Gen. Robert E. Lee’s Army of Northern Virginia. Scattered Confederate forces consolidated in North Carolina, the Confederacy’s logistical lifeline, where Sherman defeated Gen. Joseph E. Johnston’s last-ditch attack at Bentonville. After Sherman was reinforced at Goldsboro late in March, Johnston saw the futility of further resistance and surrendered at Bennett Place near Durham on April 26, ending the Civil War in the East. and Sherman began negotiating the inevitable Confederate surrender. Johnston’s army was marching back up its supply lines as it moved west, meeting trains bringing food and equipment from Salisbury under the direction of Gen. P.G.T. Beauregard. The Confederate supply situation here contrasted sharply with that confronting Gen. Robert E. Lee when he evacuated Richmond and Petersburg on April 2–3 and marched west, away from his supply sources, planning to turn south and join Johnston. Lee lost valuable time at Jetersville waiting for supplies that never arrived, which enabled Federal cavalry to block his way south. The soldiers in the Army of Tennessee revered Johnston, who was known for taking care to see that his men were well fed and supplied. While Johnston’s critics believed that he was overly cautious, most soldiers thought that he was unwilling to risk their lives unnecessarily. Johnston himself was concerned that he had been returned to command of the army to serve as a scapegoat for failure — a concern that later proved to be well founded. (sidebar) Gen. Joseph Eggleston Johnston had a unique connection to Alamance County. Here, his father, Peter Johnston, and his father’s close friend, Joseph Eggleston, had fought under Lt. Col. Henry “Light-Horse Harry” Lee, Robert E. Lee’s father, during the Revolutionary War at an engagement known here as Pyle’s Hacking Match. Johnston was named for his father’s friend and carried his sword, refusing to leave the Seven Pines battlefield without it after he was wounded. Location. 36° 5.643′ N, 79° 26.173′ W. Marker is in Burlington, North Carolina, in Alamance County. Marker can be reached from South Main Street. Touch for map. Located at the Burlington Depot. Marker is at or near this postal address: 200 South Main Street, Burlington NC 27215, United States of America. Touch for directions. Other nearby markers. At least 8 other markers are within 2 miles of this marker, measured as the crow flies. Norfolk & Western Caboose #518654 (within shouting distance of this marker); North Carolina Railroad (was within shouting distance of this marker but has been reported missing. ); Camp Alamance (within shouting distance of this marker); Pine Hill Cemetery - Veterans Memorial (approx. 0.8 miles away); Dentzel Carousel (approx. 1.2 miles away); J. Spencer Love (approx. 1.2 miles away); Pioneer Plant (approx. 1.3 miles away); Henry Jerome Stockard (approx. 1.7 miles away). Touch for a list and map of all markers in Burlington. More. 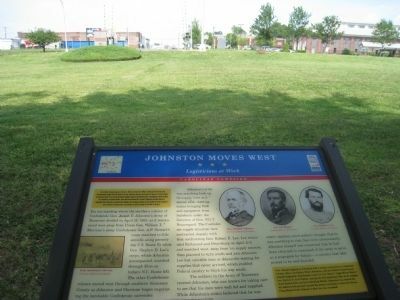 Search the internet for Johnston Moves West. Credits. This page was last revised on June 16, 2016. This page originally submitted on August 12, 2011, by Dave Simpson of Durham, North Carolina. This page has been viewed 559 times since then and 4 times this year. Photos: 1, 2. submitted on August 12, 2011, by Dave Simpson of Durham, North Carolina. • Craig Swain was the editor who published this page.